KLS believes in working closely with industry organizations. Working with industry associations allows us to stay on top of trends, technology and policy changes in our ever-changing industry. It is also an opportunity for KLS to put our experience to good use by contributing to the industry and community. KLS Earthworks holds a valid Certificate Of Recognition (C.O.R.) and is a member of the Partners in Injury Reduction Program through the Alberta Construction Safety Association and Alberta Employment, Immigration and Industry. 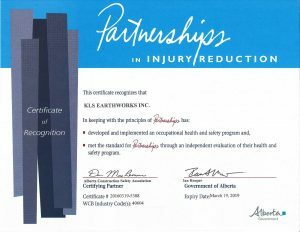 This certificate confirms that KLS’s safety program has been rigorously inspected by an independent auditor and meets or exceeds Workplace Health and Safety standards and meets the requirements of the ACSA and Alberta government. KLS has been a member of the Alberta Safety Construction Association since 1998. The ACSA is dedicated to providing advice and training that will reduce injuries and costs in workplace incidents. KLS was the 2013 recipient of the ARHCA’s Safety Award for employers with 50,000 to 100,000 labour hours. KLS has been a member of the ARHCA since 1995. The ARHCA is a membership that provides insight into construction, environmental and safety practices. KLS’ Chief Estimator has been the Co-Chairman of the Calgary Region Committee of the ARHCA since 2010. KLS has been a long-time member of the CCA. 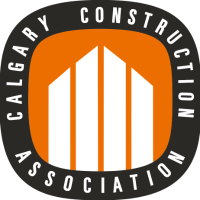 They are the voice of the construction industry in Calgary by encouraging excellence in construction and honorable practice in the conduct of business. Being a member assists KLS with obtaining the latest construction-related information, fostering industry relationships, and providing construction related education opportunities. KLS has been a member of the ESAA for over 3 yaers. The ESAA is dedicated to supporting a strong environmental services industry through their leadership in promoting and developing this industry through education, events and meetings which facilitate productive relationships with relevant organizations and government. 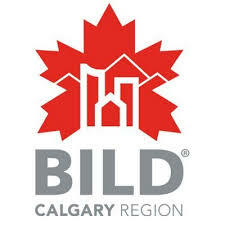 KLS is proud to be a member of BILD Calgary Region. BILD is the respected voice in the building industry which encourages effective policy and regulation for building great cities in our region. KLS has been a member of the Merit Contractors Association since 1994. Merit Contractors is dedicated to developing employment and development services and training to construction industry workers. KLS Earthworks is a member of ISNetworld and ComplyWorks. These are global resources that monitor and prequalifies safe contractors. KLS has held memberships with these organizations since 2012. 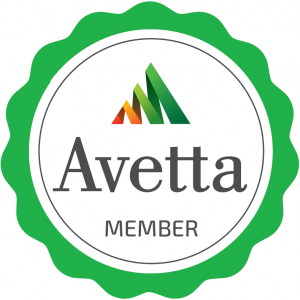 Avetta (formerly PICS) auditing is a global resource that monitors and prequalifies safe contractors. KLS obtained a membership with Avetta in 2014. KLS Earthworks has been awarded the prestigious Best Safety Performer Award 3 consecutive years from 2003 to 2005. This award is presented by Alberta Employment, Immigration and Industry to only 230 employers province wide. The award recognizes Alberta employers with exceptional performance in workplace health and safety.